The nature of digital Dasein at this precise moment in time flickers between the extropian utopia of infomorphs and the apocalyptic bodies-with-organs getting ready to be harvested for the clone market. Lusitania's latest edition "Being-on-Line, Net Subjectivity" attempts to sidestep this predictable virtual current by attaching itself to the pragmatic flow of e-mail culture--the base materialism of the internet, to de-cipher this endless chat session. Alan Sondheim sees this as the core element of this new space,"the Net at the lowest level permits free-flowing textual communication, email and live chat, and it is in fact at this level that community bonding seems strongest." 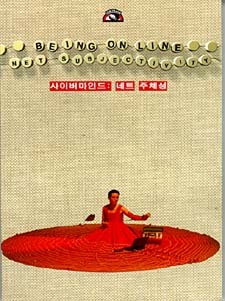 Being-on-line is not a state-of-Being, but a tool-to-Becoming, its a matrix of performativity which allows individuals to connect with others as themselves, as themselves-as -(an)Other, and the Other-in-themselves for others. Sometimes its all of the above in one posting. "Being-On-Line" captures this moment with an acute sense understanding and care--that could only come from individuals speaking from the flow-as-home. The problem in gathering all the lurkers, ghosts, threads, protocols, and communities that drift in this space--is that this tool-for-endless discourse must be bound within the traumatic shell of the book. Of course its much easier to access and navigate the tradition of the text for most of the world than it is for people to negotiate the spaces of recognition between machines--and to a great extent "Being-on-Line" does create a cross-over platform between these two forms of writing. Email addresses are provided, for almost all the writers, at the beginning of each essay creating the aura of communication, the call to participation, which being-on-line allows. URLs are kept down to a very low roar, a choice that counters the massive propagada that is flooding us everywhere--but the WEB is not discredited either, several image based works appear through out the journal, three filp books and a comic strip--yet, one can sense the struggle between word culture and image culture playing itself out on the horizon. A spectral clash between WEB agents and NET subjects all seeking to be on top of the pile of "collective intelligence." "Being-on-Line" attempts to ground this frenzy under the sign of "net subjectivity"--this is the only gesture that doesn't function within the topology of singularities that create this social space. The effect of subjectivity creates a limit to the process of hyperexchange that is taking place among these groups. Its a state of Being that can easily be repositioned within the market of info-commodities--rather than pushing open the uncanny tendencies of these groups to become something Other. It is the endless streams of dialogue, of criss-crossing micro-narratives, and all the shape changing--that drives the lines of ascii desire and not the static foundation of Being.